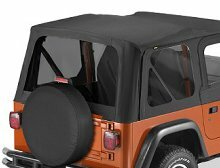 Jeep 97-02 Wrangler; Fits Replace-A-Top 51121, 51124 or 51127. Black Denim. Bestop offers replacement parts for your aging, damaged or lost door skins and windows. Applications for Jeep CJ-7, Wrangler and Wrangler Unlimited. Window kit consists of two side windows and one rear window. Replaceable heat-sealed windows (31% tint) meet U.S. and Europe regulations. Replacement door skins fit factory door frames using velcro for quick, easy installation.